» Say No to Electronic Billboard on Ventura Blvd! Say No to Electronic Billboard on Ventura Blvd! This coming Thursday, Aug. 28, an important hearing will be held on a proposed electronic billboard on Ventura Blvd. in Encino. These billboards have been routinely approved in other areas of the city, despite serious questions about issues such as traffic safety, light pollution, and energy usage. But now those opposed to turning our public spaces into a backdrop for garish electronic advertising have the opportunity to be heard by a governmental body that appears to be taking these concerns seriously. 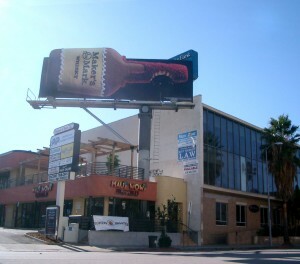 The 14 x48 ft. Clear Channel digital billboard at 15826 W. Ventura Blvd. would replace a conventional billboard on the site. It was approved with conditions by Gail Goldberg, the city’s Director of Planning, but that approval was appealed to the South Valley Area Planning Commission, which will hold the Aug. 28 hearing. It is very important that people send comments to the commission and, if possible, attend the hearing. –The billboard was wrongly given a categorical exemption from environmental review on the grounds that the conversion from conventional to digital is a minor alteration. Such a billboard will have significant effects on its surrounding environment. A huge, brilliantly-lighted sign with changing images raises questions of driver distraction and traffic safety. It will use far more energy than a conventional billboard and create potential light pollution for nearby residences, as such billboards have in other areas of the city. –The Ventura/Cahuenga Boulevard Corridor Specific Plan explicitly prohibits new billboards on Ventura Blvd. An electronic billboard is not simply an alteration to a conventional billboard. It is different in every way but overall size, and ought to be considered a “new” billboard and thus prohibited. In fact, the conversion to electronic requires everything but the supporting column to be replaced, which further supports the view that it is new. –The specific plan points out an excess of billboards and other forms of signage on Ventura Blvd., and calls for limitations on this visual clutter. Approving a new electronic billboard will set a precedent for many others like it, and vastly increase the visual clutter and blight. This is completely contrary to the intent of the plan.